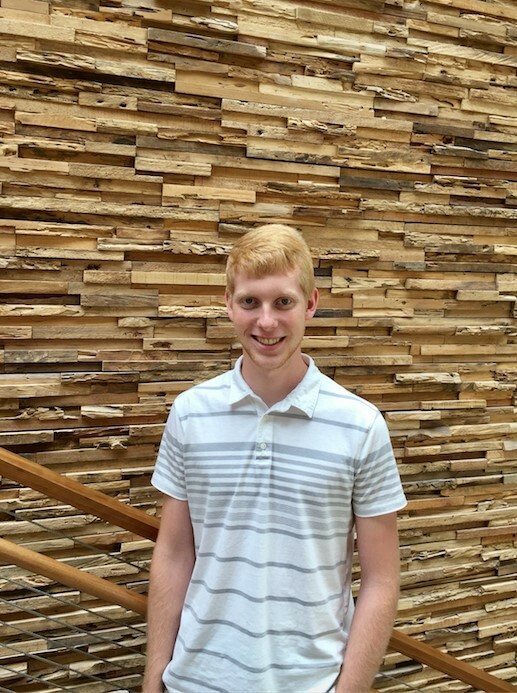 Brady Trent is junior at Iowa State studying Mechanical Engineering. He recently was selected and participated in the 2017 CYstarters Summer Accelerator. Passionate about: Family, friends, religion, and of course, minding my own businesses. I also love to run a fantasy football league! Most recently I…took a camping trip to Rocky Mountain National Park in Colorado with my dad, younger brother, and girlfriend. My favorite business book: Rich Dad, Poor Dad by Robert Kiyosaki because it really helped kick start my goal to become financially independent. RenterGate helps property managers with day-to-day business operations so they can save time and increase their bottom line. 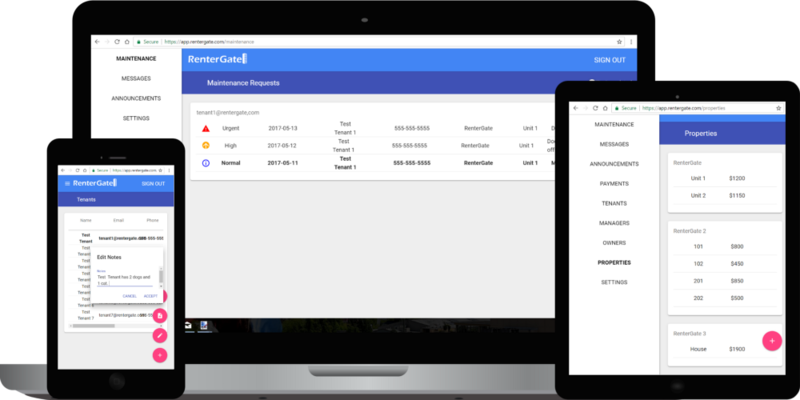 By creating a software that allows managers to receive online payments, maintenance requests, and communicate through our powerful messenger, we believe our property management software is designed to modernize the property business. The RenterGate interface for property managers. Users will be able to operate the platform in a variety of ways to understand the ‘pulse’ of each of their rental properties. RenterGate is focused on property managers with 50 units. Right now, we are focusing on properties in the United States. Our target market is property managers with 50 units. This segment of people is often underserved. In the future we will expand our scope to those who are managing 500 to 1,000 units. We started in March this year. I recently went out on a limb to connect with a mutual friend via LinkedIn. This person provided fantastic feedback and he validated our business. This was a huge step for us to know that we are headed in the right direction. Later this year we are looking to partner with a large property management company that has over 2,000 units. This will give us the opportunity to license and scale. Why has your business been so successful? I would truly say that it is the people who are working with me on RenterGate. My dad has helped me get connected to so many people. My other business partner is a great software developer who makes RenterGate possible. In addition, being in CYstarters has pushed my boundaries. I used to never pick up the phone to call because I was just building websites. I thought I wouldn’t have to go talk to these people, I believed my dad could do it for me. Nowadays, that is who I am, I am the guy who goes around to all the meetings. I now feel comfortable reaching out to those people who have 1,000 units. The networking has been the most beneficial thing. I have met so many people. The education sessions are great as well, I have definitely learned a lot. Like Judi Eyles says, Start Something! My current goal is to keep getting connected with people who have rental properties. What will make me happy personally in the future is for RenterGate to be successful as possible, while also building my own property rental and investment company. Overall, I want to be a multimillionaire business owner with the freedom to start my next project and so on. 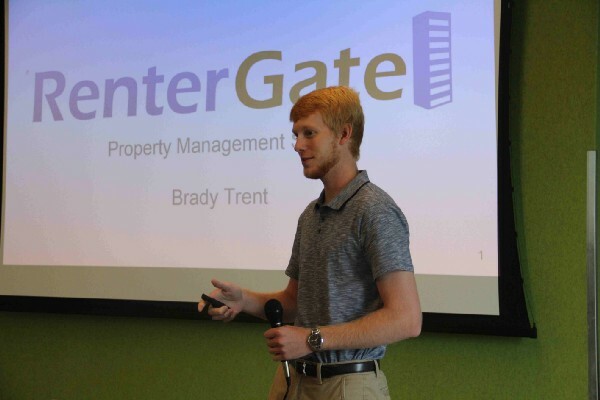 Brady Trent delivering his pitch during the CYstarters’ Celebration on July 28 at the ISU Economic Development Core Facility. Reach out to Brady if you are someone with rental properties, manage within a property company, or in general want to help & follow along his journey!